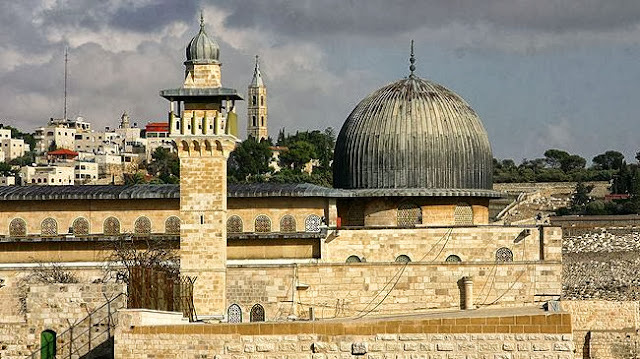 According to the report recently published by the al-Aqsa Foundation and based on the information leaked from the Israeli Knesset, the plan will divide the compound, taking one fifth for the Jews in order for them to perform their religious rituals there. Senior officials from the Palestinian resistance movement, Hamas, have spoken out against the move, calling for a large-scale intervention from Arab states. Leader of the Hamas Political Bureau Khaled Mashal stated that the measure is part of the Tel Aviv regime’s strategy to demolish al-Aqsa Mosque and eradicate Islamic history of the site. Speaking in a televised speech on Saturday, Hamas Prime Minister Ismail Haniyeh condemned Israel’s efforts to Judaize al-Quds and the al-Aqsa Mosque. He also censured Israel’s expansionist policies and the regime’s crimes against the Palestinian nation, saying the liberation of Palestine is a national duty. Political analyst Ahmad Rafiq Award has told Press TV that the Israeli’s move to build a synagogue at the al-Aqsa Mosque is unlikely to provoke any reactions from Arabs given the ongoing crises in their countries. “The Israeli authorities have conducted these plans in a surreptitious way and in small steps in order to brainwash the Jews, and people from the Arab states. By taking one fifth to begin with, they will start to falsify the history on the ground,” he said. “They will use these plans in an attempt to unify secular Jews, who are in dispute about demolishing al-Aqsa (Mosque). It is also very unlikely that Arab states will intervene while they are dealing with their revolutions and internal issues,” the analyst pointed out. Over the past decades, Israel has tried to change demographic makeup of al-Quds by constructing illegal settlements, destroying historical sites and expelling the local Palestinian population. Palestinians are seeking to create an independent state on the territories of the West Bank, East al-Quds, and the Gaza Strip and are demanding Israel to withdraw from the occupied Palestinian territories.